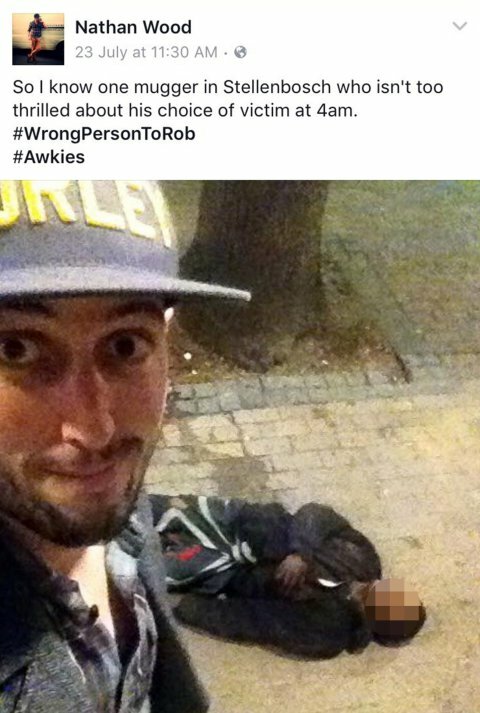 Meet the man who knocked out a mugger and took selfie with him. An accountant, Nathan Wood, 27, said he was with a friend outside a nightclub in Stellenbosch, South Africa, when two men started to follow them. They were cornered. Mr Wood who is from Cape Town, said the men followed him and his friend into an alleyway and then threatened them with a big knife. One of the muggers held the knife to his throat. The main culprit tried to convince me it was in my best interest by brandishing a fairly large dagger and holding it to my throat,’ wood said. But Mr. Wood shocked the thief by knocking him unconscious with a well-timed power punch. The other mugger then dashed off. Probably proud of his impressive handwork, Nathan dragged the unconscious mugger out of the street and snapped a selfie. and placed it under his head and arranged him in the recovery position before calling security. He was at first critisized for his actions. Mr Woods said he got a lot of backlash over the selfie at first, but soon he was flooded with messages of congratulation. Nathan believed that if he hadn't taken matters into his own hands, he may have ended up seriously injured or dead.